A short and punchy Friday podcast scrutinizes the backstabbing of provincial Liberals by 2 former federal MP's who endorsed NDP Health Minister Theresa Oswald in Seine River, the Wolbert-esque Anita Neville and the irrelevant John Harvard. With friends like these, Jon Gerrard can declare his enemies quota filled. Greg Selinger was on CJOB today and was dragged into addressing two of our favorite topics, the price of milk and a youth curfew. Wait till you hear how he answered the question of an outdoor sleepover in the north end. Speaking of sleepovers, we also have an eyewitness account of the CEO PR stunt for homelessness at 201 Portage last night. Doncha dare miss it! A longtime fixture on the local boxing scene, autobody shop owner John Vernaus decided to get into the race to succeed former Manitoba Speaker of the Legislature George Hickes as MLA for the inner-city riding of Point Douglas. Vernaus has been running some very strong radio ads about the numerous murders and rampant crime in the riding (just yesterday a knifefight between rival gangbangers broke out on the street across from his campaign office) and his own accomplishments in the community. He took about 20 minutes to talk with us last week and our discussion - about why he is running, what he is hearing at the door, and what he thinks about whether Greg Selinger really didn't recognize his name - is the centrepiece of today's podcast. Among the other issues touched on are the CBC exclusive alleging flood mis-management by the NDP at the Hoop and Holler cut; recapping the FASD coverage of yesterday; Gordon Sinclair gets beat up by his own readers for utter irrelevancy; was there a political bias behind Daren Jorgenson being hauled into court the Freep missed? ; and the cushy "homeless" sleepover PR stunt tonight at 201 Portage that will feature U of M doctor-school boss Brain Postl, Free Press publisher Box Cox, and other local CEO types previously victimized by typos. (Well, at least those two were). Free Press online comments were not so accepting of the stunt; meanwhile Graham Hnatiuk, who sat in on the podcast yesterday, blogged some very good observations here about the Downtown Biz event. And at the end of the show, I reminisce about the old days at the soon-to-be-demolished Junkyard, replete with Chuck Green imitation. The intertwining of health, crime, and public safety is a major election focus of the Wednesday podcast, with a special candidate interview plus a guest commentator joining in for the Inside Politics analysis. The Liberals' $3.9 m FASD platform presser is reviewed, and St James candidate Gerard Allard speaks about his move from policing to politics, the social cost of undiagnosed FASD and of a surprising 'missing' issue at the doorsteps. Then blogger Graham Hnatiuk returns to TGCTS and has a few things to say about the media, Liberal campaign, and l'affair Wolbert. We also dive into CBC's story yesterday about the grlforum.com we've been talking about for weeks, the online community of doctors, nurses and others (some of whom fear retaliation from the WRHA) who bring out their evidence that the NDP system is bullying and wasteful. The CCPS Update highlights Tom Brodbeck's rip on Greg Selinger for suddenly remembering the NDP was worried photo radar was a cash grab after years of total support for it; and we explain how he isn't old enough to vote, he isn't old enough to drive, but the suspect arrested for homicide #32 is old enough at 14 to be carrying a gun in the north end at 4 in the morning on Sunday. Oh, and it might be retaliation for #30, a 15 year old knifed 4 blocks away. And would you please take a look at this petition to support the police K9 unit and consider signing it? Officers in the Winnipeg Police Service K9 Unit are looking for people to sign their petition. They are petitioning the government (municipal and provincial) to put the funding back to build proper Kennels for the police service dogs. These dogs provide a huge service and they aren't being treated with the respect they deserve. There used to be kennels but they were torn down. There was a promise to build bigger and better ones when the police station on Dugald was built and that funding was pulled. These dogs need our help. Feel free to pass this link along. Two half-baked polls - one with less than 470 declared respondents and the other conducted online and then extrapolated - leave Manitobans no wiser as to which direction the 2011 election is headed. Today's podcast does a quick review of the latest promises and opinions - expanding Osborne House finding favour with the Tories and soccer facilities with the NDP; our story about a political contribution by Theresa Oswald's US husband makes the online comments, if not the actual news pages, of the Free Press; some follow-up comments about the Selinger photo story, including CBC's apology to us for not providing proper credit; and what blogger Brian Gilchrist thinks about Selinger's claim on CJOB that the NDP has run a clean campaign. In the middle you'll also hear an interview with Tahl East of CDI College, whose Bras for A Cause campaign is now featured on billboards and in Swaggerville; homicide number 32 has two north end bloggers reacting here and here ; and a look at the first day of the trial into the murder of John Radocaj, courtesy of the blog writings and Metro story of James Turner. 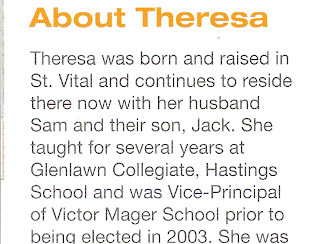 It started on Twitter, with notices from James O'Connor of the Brandon Sun and local news site Chris D. Then the national online aggregator, Bourque.org, posted a link right to our story "The One Photo Greg Selinger Does Not Want You to See in an Election Brochure"
beneath stories about the federal NDP leadership race and the Ontario election. So there is no denying, the alternative media made a big splash in the provincial election on Friday. Even the Winnipeg Free Press managed to crank out a few paragraphs online about the controversy, making sure not to identify our podcast as the source. Today our inside story of how the story was brought to light and how the mainstream media reacted to it, what the commenters and politicians said, and how this picture of Greg Selinger being duped actually relates to a story told by my mentor Yoram Hamizrachi about Pres. Bush Jr. and the middle east. and in the crime update, Richard Cloutier uttered the C word today at 9.47 AM. The 6 letter one we've been talking about since the podcast launched. Plus, shout-outs to our new Twitter followers and don't forget to read part 3 of my profile of RCMP Commissioner-applicant, psychologist Dr. Michael Webster ! North end Liberal candidate says campaign dirty tricks "bullying"
The outspoken Grit candidate in Burrows, Twyla Motkaluk, told TGCTS today that campaign signs being stolen and illicitly removed are not the only tactics being used to try to derail her campaign. As you will hear, she claims that racism has been wielded to dissuade voters from supporting her at the ballot box. Calling it the behavior of NDP bullies, she also told of one example of government waste that led her to seek election, a Healthy Baby subsidy program for pregnant mothers that Motkaluk claims provides about 33c per day for nutritious groceries while the administration of the funding consumes over 80% of the monies. Along with reviewing the Liberal platform released this morning - which included Dr. Jon Gerrard endorsing our longtime call for having Legislative meetings and Question Period archived online! - a bloggers' hypothetical script for a faux Greg Selinger job interview TV ad, an email from a listener who got surveyed online about their voting intentions, Dan Lett's views on downtown safety, and the ethics of an NDP cabinet-ista ( no, not Theresa Oswald, the subject of yesterday's exclusive) - appearing in a community TV ad, are on the agenda for today. Oh, and a great quote from my cousin Avi Saper. A faithful listener of our program, who has taken quite an interest in the way politicians get their message out in the hopes of being elected this October, sent along a copy of a pamphlet dropped in their mailbox, a standard 8.5 x 11 folded. They had a few questions which are a little confounding, and perhaps some of the more informed among you can help clear up the confusion. Now at first glance there doesn't seem to be anything unusual. A candidate, in this case a government Health Minister, is providing some personal career background and towing the party line. Oswald, of course, is well remembered from her days as an English teacher - sources say she was given the nickname "Dragon Lady" for her firm attitude with students - and was a volleyball coach. 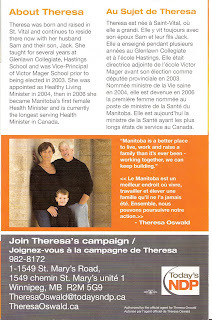 The middle section of the pamphlet has a quote - bilingual of course - beside the family portrait. "Manitoba is a better place to live, work and raise a family than it's ever been", Oswald tells her constituents in Seine River, as she implies she shares their experiences and so, they should vote for her to continue on as their MLA. Our listener, though, found Oswald's urging ironic. Because it appears not everyone in the family portrait found in the Health Minister's election advertising, is living and working here. The listener discovered that her husband, Sam McCreedy, is a member of the Language Arts faculty of Apple Valley High School. Which is in Minnesota, about a 10 hour drive from Oswald's address. He's even a member of the state volleyball coaches association. The question raised by the listener was, how can Theresa Oswald ask voters to re-elect her on the basis that under the NDP, Manitoba is better than ever to work and live in, but it isn't good enough for her own family members? Now that is not to say that Mr. McCreedy is not supportive of Oswald's beliefs. After all, according to page 19 of the NDP Annual Returns for 2010 on file with Elections Manitoba, he gave $1020.00 to the party. 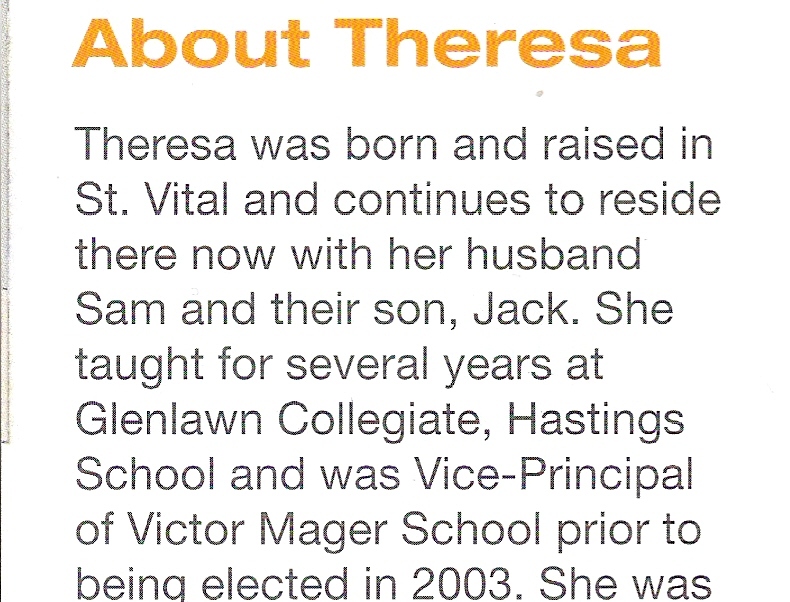 That wouldn't be unusual, except that the Voter's List shows only Theresa Oswald as a registered voter at her home. 41(1) No person or organization other than an individual normally resident in Manitoba shall contribute to any candidate, leadership contestant, constituency association or registered political party. Mr. McCreedy appeared on page 60 of the 2009 -2010 Apple Valley handbook as a Language Arts instructor. And the same page in the next year's handbook. It appears that Manitoba has never been a better place to work and live, unless you're the husband of the NDP Minister for Health, who seems to have been teaching in Minnesota for at least the last 3 years. Based on the information at hand, Sam McCreedy's contribution to the NDP in 2010 would be illegal. Not that this would bother the NDP, given their past record of election finance fraud and cover-up. "Manitoba's Finance Minister Greg Selinger, the man responsible for ensuring tax money is spent properly, admits he's known for six years of the scheme by the NDP to defraud the province of hundreds of thousands of dollars. He never went public, although he did insist on a letter from the NDP executive in 2003 exonerating him from blame." Also on today's podcast: a blogger reviews the 'Downtown' debate last night; Free Press readers raise a lot of questions why the North End is only to be made safe when the poverty industry complains and Lloyd Axworthy can grab a headline; a Free Press reporter quotes another reporter's wife without realizing it; and in the Crime Courts Public Safety update, the gentrification of the crack epidemic in Winnipeg. PLUS, the return of Frank the Italian Barber ! The outcry about the cheating tactics of the NDP campaign hit the pages of both the Sun and Free Press, and the credibility issues resulted in Greg Selinger facing pointed arguments from his opponents for the Premier's seat, OB callers, and host Richard Cloutier this morning (who seems to have identified an issue today about full time home care jobs being created as part of a "sweet deal" with the MGEU to the detriment of patient care. Imagine being told you get one bath a week, it was going to be on an afternoon you go to a church activity, and it was being cut back to 25 minutes from an hour). Today's podcast recaps the weekend announcements and the topics of the morning debate and juxtaposes the campaign priorities the PC's and Liberals set out on strokes, diabetes, emergency response and care homes, with Selinger's performance on-air and increasingly irritated retorts to accusations of using his a way-back machine and his "Crocus calculator" to create a "phony reconstruction of the 1990's". Harping on the supposed Filmon record rather than account for the NDP record after 12 years in power is losing traction with voters and some local media types who want answers and accountability, not homilies to "optimism" and the wonders of the WRHA. The phrase "Brian Sinclair" was heard today on CJOB, as it is in many forums now. Also today, another phrase not heard - but it could have been - was Cheez Whiz as the price of milk in remote communities was Cloutier's punch line at the end of the debate, we report on more dirty elections tricks against a non-NDP candidate, and ask, is it proper for public and institutional officials like Dauna Crooks, Elliot Levin and Suzanne Hrynyk to be pumping the NDP campaign ? "You can’t throw out information and say the citizens are engaged." PS - coming up tomorrow: A star candidates' brochure says some wonderful things about Manitoba trying to woo voters but does the reality of their own life reflect those beliefs ? plus the Greg Selinger job interview parody, a great FP feature from the weekend about BiPole dividing west-side community opinions, and an exclusive insight into the gentrification of the local crack epidemic. Nothing illustrated the contrasts between the strategy of the opposition parties and that of the NDP as week 2 came to a close, than the nighttime report on Friday by Kim Lawson of CJOB. A number of listeners made mention of it to us, and with good reason. She started off by reporting that PC leader Hugh McFadyen pledged to extend operations of clinics to take the pressure off emergency brooms, add ambulances and paramedics, and initiate a specialized stroke unit to save lives; then that Liberal leader Jon Gerrard was focusing on investigating abuse of the elderly in personal care homes and the over-prescribing of anti-psychotic drugs as a way to numb patients despite the added risk of causing strokes. Those were substantive proposals that spoke to the problems and worries of voters about their families and how health care delivery is managed. Kim Lawson contrasted what the opposition leaders did on Friday, with what the NDP leader did. 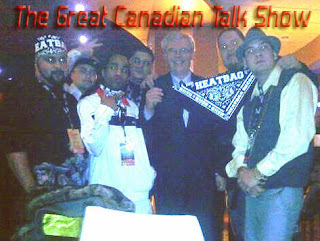 Greg Selinger held a press conference with the owners of the Winnipeg Jets. To hear her recap what she saw and heard in her report on the campaign day, was kind of startling to listeners. They made a point to let us know about Lawson's summary. The un-elected Premier engaged in what the front page of the Winnipeg Sun proclaimed was outright cheating, by making a government announcement while hiding behind the purity of the Return of the Jets. Perhaps his brain-trust figured no one would dare complain about something targeted at 'helping at-risk kids', even if they realized the law prohibited government announcements within 90 days of the vote. Maybe they planned on arguing that it was exempt from the legislation because it related to theories about child safety. But once media outlets, including ChrisD.ca and CBC, slugged their headlines as "Province and Jets team up" rather than "NDP promises to team up with Jets", it was obviously not a 'misunderstanding'. CBC, CJOB, The Sun, CTV, all picked up on the blatant breach of the Elections Act by the NDP. If it were a misunderstanding, Selinger would not have "brushed aside questions" from reporters that morning. He would have tried to set the record straight. Only the Winnipeg Free Press repeated, without question, the desperate cover-up spin of the NDP after being caught in a bald-faced attempt to fool the media and get an unchallenged "happy news story" in front of the public. So the Free Press reported that Greg Selinger and the NDP acted to break the elections law, then simply revised their story to match the NDP's sanitized version of their actions after Gerrard raised the ante by filing a formal complaint. Consider it A Lesson in Journalism. After having to think for a few hours to make an excuse, Selinger claimed to CJOB it was just a follow-up of a week-old campaign promise about mentorship, which no one buys because it was not presented that way to the media - or the headlines would have said so i.e. "NDP pledge moves forward by teaming with Jets". We delved into this subject on Friday's podcast, as another example of the ethics and credibility gap of a party that watched over the collapse of the Crocus Fund Ponzi scheme, lies about Tory "plans" to sell Manitoba Hydro, lies about BiPole, and lies about the size of the deficit, but wants the public to be scared of a change in government to another party. On Monday's podcast, we'll review the media and online reaction to the NDP campaign trick that failed, report on another campaign dirty trick, and reveal how the crack epidemic in Winnipeg has relocated under the NDP's watch, right under their nose. It will be online in about 2 PM. As the NDP campaign of attack ads continues to backfire, unelected premier Greg Selinger resorted to playing the Jets card today with disastrous results. A feel-good presser to announce an after school program for at-risk kids was immediately identified by media outlets (here and here ) as a (prohibited) "province" or government announcement, and not an NDP election pledge. This comes on the heels of an Elections Manitoba investigation into Cabinet minister Ron Lemieux presenting a cheque within the 90 blackout period. Today's podcast looks at the official complaint filed with Elections Manitoba and at Liberal leader Jon Gerrard's terse accusations about the NDP being "so arrogant and indifferent to Manitobans that they think they can break the law and get away with it ... What kind of lesson is Greg Selinger sending to inner city youth by breaking the law?" Also up for discussion, including an email from a sharp-tongued listener, is a desperate attempt to manipulate Jewish voters using scare tactics and ancient history - by a columnist who did not reveal his links to the ruling party. And please feel free to read Part Two of the Mike Webster story: Ruling the Ring, I am very proud of it. Two weeks ago TGCTS asked whether ethics and integrity were going to play into the consideration of Manitobans during the election campaign. Now, after former senior executives revealed that Greg Selinger himself enacted a referendum requirement before Manitoba Hydro can be sold, with the spectre of possible criminal charges in the Brian Sinclair death at HSC in 2008 being reported yesterday, and the ongoing revelations about the NDP hiding loans and grants as 'assets' on the provincial books, the issue of honesty and integrity has gained traction in the media and in the minds of voters. Reports about Selingers' "frustration" with opposition claims and election promises are contrasted on today's podcast with the NDP record on those 3 files and how whistleblowers and red-flag wavers (like Dr. Larry Reynolds and Miss Whistle) are treated by the government's bureaucracies and agencies. While Free Press columnist Dan Lett portrays Hugh McFadyen's statements about the NDP misrepresenting the deficit as 'true but false', there is no doubt that voters who read the Freep online are now taking seriously the issue of NDP integrity and accountability. Potential hikes in Hydro and MPI rates to cover their spending tracks may lurk in the minds of the electorate before the campaign is through. PS - I forgot to mention on the podcast today, that part two of my 3 part interview with former CFL Grey Cup winner/Wrestling champion/RCMP and CIA consulting psychologist Mike Webster is posted at Slam!Wresling, please look it over! A lot of important people (ie the WRHA, Manitoba Nurses Union, Health Minister Theresa Oswald) had a startling beginning to their day with the report in the Free Press that a homicide investigator had recommended the Crown lay charges against both a front line care worker, and the Health Sciences Centre, over the death of Brian Sinclair after a 34 hour wait in the emergency room in September 2008. Denials that a report had been completed, let alone charges recommended, were issued in record time, but the story had the reputation of ace cop reporter Mike McIntyre behind it, and the denials did little to quell the buzz among listeners about how "the NDP had stalled the Inquiry till after the election and now this gets out". On todays' podcast we go into depth about the Loan Act, which is the way the NDP is shifting monies to outside agencies that can never pay it back while claiming the dollars still exist in the treasury, thereby concealing how big the deficit really is. Translation: can you say tax increase to pay for the loans? Listen for the surprise realiziation about which pet project of millionaires may have benefitted from the book-cookery while providing cover for their political allies at city hall. Another episode, another report of stolen campaign signs. It's pretty obvious from the victims, who the perps might be, and we even have a partial physical description of one of the dirty tricksters. FP edu-beat fella Nick Martin can't stop blogging his feelings about Dr. Jon Gerrard refering to the 'Field of Dreams' purchase of the Midway Chrysler land being an unfulfilled NDP promise (and an eyesore), and the paper quickly ran a follow up to explain why the new 'green space' at Gordon Bell HS is behind schedule ie. needing to raise $500,000 for astro turf (does that count as green space), plus another $800k on top of it. We parse the stories and comments to give some perspective on the political opportunism behind it all - without even mentioning the name Pat Martin! Plus, by stumbling across a column about the inner city by the poverty industry in today's broadsheet, we launched into a lesson in electioneering, and explain the links between the 'grassroots organizations' being lauded and the party that was not named that was also being patted on the back and promoted. Or, as one onliner said: Are the numbers in this article just a platform for the NDP? There's a 6 letter word that might, might, have saved gang-involved Clarky Stevenson - and may save other children - and TGCTS is waiting for one of the leaders to say it out loud. Today's podcast strings together reports from mainstream and alternative media to paint a picture: about Manitoba Housing ignoring health hazards (CBC TV), Manitoba Hydro refusing to give a mailing address (Les.net), the sneaky accounting to reduce the provincial deficit picture (Bruce Owen via blogger Brian Gilchrist http://bgilchrist.wordpress.com/2011/09/12/the-campaign-of-misinformation-and-lies/ ), and online comments from voters about NDP promises to hire more nurses and cut cancer wait times - there are a lot of people whose experiences with these Crowns, agencies and departments, hospitals, etc, demonstrates that an entitled class is running this province and has but one goal- to stay employed in power. The facts now coming out about how the books have been cooked for years by Greg Selinger not reporting loans and advances properly, and how Tom Brodbeck is told to file a FIPPA to get to see stadium loan documents, is a red flag our listeners will well recognize. Also, a shout-out or two; is Dr. Jon Gerrard exaggerating about Winnipeg being Detroit North? ;, how cops took down a one man crime spree overnight; and the reaction of Free Press readers to Margo Goodhand preparing to sleep outside for a night as part of a publicity stunt, to show how she cares about poverty and homelessness. Whatever will she wear? The phrase Granny Clampett comes up. Winnipeg's premiere podcast tells you the story of a remarkable dirty trick played in the election, from a north end riding no less. It's quite clever although highly unethical and shows someone is scared of someone else gaining ground. Also today, Metro reporter James Turner echoes our position that rampant alcoholism is fueling violent crime in this city and should be an election issue; Dan Lett isn't very complimentary about the attack ads on Hugh McFadyen but still thinks the NDP is ahead in the race- although he didn't seem to consider another variable; and Kevin Engstrom of the Sun blasts the NDP for gutter politics. In civics, Gordo's column about a proposed Waterfront Drive development in the FP this weekend was so obnoxious that blogger Cherenkov was compelled to make sure everyone knew the history of Sinclair distorting the plans at Upper Fort Garry to generate support for the Manitoba Club members engineering the kaiboshing of a much-needed apartment block to preserve their back yard view. Since Gary Filmon is involved in some way with the Waterfront deal, I set the record straight that this was a ploy by Gordo to use his bully pulpit to demonize the Tories, even tangientally, yet again. We review the facts of how the bike lobby and their enablers inflated attendance figures at past Ciclovia events for political purposes, and in the crime report, two weekend stabbings lend rise to a 6 letter word no one dares utter to protect our youth from each other - curfew. Plus shout outs to bloggers and twitterists including Rae Butcher, John Dobbin and Airchecker! Yesterday in the Winnipeg Free Press, NDP campaign quick-response director Maeghan Dewar was "insisting the NDP has improved health care during 12 years in power." Today's podcast contrasts that spin, with a story in the Jewish Post and News about the horrific treatment of 98 year old Ann Rostecki in 2009 at the Seven Oaks General Hospital. Bernie Bellan includes documentation and correspondence to lay out the entire tale of neglect - including starvation of the elderly stroke victim - and the dismissive contemptuous attitude towards the children who advocated for their mother. Had we, as children, neglected our Mother's care in the fashion of that at Seven Oaks Hospital, we might have been brought up on charges under Section 215 of the Criminal Code of Canada under The Vulnerable Persons Act. Having the word 'hospital' in one's name, however, exonerate them from the same prosecution." The subject of health care and the WRHA has yet to emerge as a campaign issue, as 'safer communities', a catch-all phrase encompassing crimefighting, courts, and social programs and supports has dominated the platforms of all 3 parties thus far. But as you will hear in our interview with Mike Brown off the top of the show, the newsman-turned PC candidate in St. Vital, even he was surprised at the level of concern in his community. And during the CCPS Update near the end of the episode, Hugh McFadyen has more to say about getting tougher on crime and spoke (this was on Wednesday remember) about expanding the use of GPS anklets to track high-risk offenders, making the point that the NDP opposed the PC position when it was announced - yet today, on Friday, they're for it. We also point listeners to a personal tribute by Dan Denton on Slam!Wrestling about the death of old-time midget wrestler Little Tokyo and their travels together in the 80's. While you're on Slam!Wrestling, check out Part 1 of my story about former Montreal Alouette defensive tackle Mike Webster, who has had an amazing journey from Grey Cup champion to main event heavyweight wrestler, to a career as a consulting psychologist for police, military forces and agencies in the area of hostage negotiations. Item Last: Keep an eye on the reporting of this weekends' ManyFest on Broadway - the mainstream media won't remind you that this resulted from a failed attempt by the Downtown Biz to close down Broadway for 4 separate festivals, so they were rolled into one weekend and STILL can't find enough volunteers. What the mainstream media also won't do, is report on the way the bike lobby and their supporters at City Hall and the Biz have inflated the attendance history of the Ciclovia event, which is the basis of all this "let's close down Broadway for a weekend" nonsense, to justify the blatant cheerleading for the bike lobby and their anti-car agenda. Hell, at first they told the truth about how many attended the first Ciclovia in 2009 - but watch how the story has changed as the demand for dollars has grown, without anyone in the media challenging the inflated numbers. Then, in 2010, BTTF claimed attendance had doubled from their "official" estimate of the year before, although TGCTS traffic reporter Kim Calder and alternative media godfather Bob Axford said it had been no bigger. In its second year, this FREE eco-friendly, healthy-lifestyles festival and active transportation initiative saw the north side of Broadway closed from Osborne to Main Street, creating a network of car-free streets from Assiniboine Park all the way to The Forks! An estimated 10,000 people enjoyed car-free streets this year for Ciclovia! Finally, in this week's Uptown, the Downtown Biz tells an even bigger whopper to an unquestioning reporter. "It’s for many people and there’s many things happening, so we thought it was a perfect fit," explains Jennifer Verch, manager of communications and marketing for the Downtown Winnipeg Biz, one of ManyFest’s presenters. Approximately 30,000 people took part in last year’s festival and the hope is that at least that many show up for this year’s scheduled events, most of which are being offered free of charge." So if the Bike Lobby, Downtown Biz, or City Hall makes any claims about the attendance this year, be assured it will be inaccurate, misleading, and won't add up with eyewitness accounts. But that number will be used to justify even MORE tax dollars and resources be used to help special interest groups and politicians build empires as summer turns to fall next year. In an exclusive interview with TGCTS, Progressive Conservative leader Hugh McFadyen dismissed the Joe Namath-like guarantee of Greg Selinger to fix utility costs at the lowest in the country as a "phony promise" and added that, given the NDP record from the 2007 campaign on hallway medicine and the return of the Jets, "these are people who have zero credibility on anything they say during election campaigns." McFadyen also pledged to uphold the independent authority of the Public Utility Board which he lauded as a safeguard for Manitoba consumers. Listen to the full Q and A on today's podcast. The Free Press elicited a response from former PC premier Gary Filmon about being used as a strawman to "fairly or unfairly" attack McFadyen for what he "might" do to Crown Corporations in new NDP attack ads. While editor Margo Goodhand mocks the notion the election is heating up as a lie, candidates in Westman struggle to get their message out because of a lack of a local TV outlet. And we point listeners to a new website www.manitobaelection.ca as a handy resource for candidates, events, and aggregated news coverage. Podcast court report exclusive: 'Labradoodle' charges face motion to dismiss; Is Selinger end-running PUB with low-cost utilities pledge? Among local media, only TGCTS was in court today to hear the testimony of witnesses in a case alleging a puppy breeder neglected dogs seized by the Manitoba government and sold under questionable circumstances by the Humane Society. And only TGCTS can report on the reaction in the courtroom today by the Crown Attorney, when defence lawyer Gene Zazalenchuk presented a motion to dismiss the charges immediately after the prosecution closed their case, citing a "fatal" flaw in the proceedings. Exclusive details in the CCPS Update today. The front-end of the show takes a hard look at the Joe Namath-style 'guarantee' by Greg Selinger that electricity, home heating and auto insurance rates would always be the cheapest nationwide. This raised two issues: is Selinger planning to neuter the Public Utilities Board, which sets pricing rates and has repeatedly turned back rate hikes proposed by the Crown Corporations? And, is a 'rate stabilization fund' just another way of saying 'slush fund' ? A Free Press opinion column - published in the guise of a news story - claiming that crime rates are falling and the provincial election pledges to deal with criminals here and now are somehow misguided and more hugs are what is needed. Oh, and that crime is only a 'perception' in the suburbs and not the new reality. A FP reader hit the nail on the head about the spin, and we give voice to those views. Another FP story where the details don't match the headline - you think a review that finds 30 pathology reports required a change in treatment isn't "major" ? Smart readers called out the broadsheet on that one today as well. Almost time to revive our "Lessons in Journalism" segments ? A brief comment about the tragic plane crash involving the Lokomotiv hockey team and Brandon native Brad McCrimmon (the link has a team photo), and some upcoming events on the local pro wrestling schedule, round out today's podcast. Oh, and a plug for my story about former CFL lineman Mike Webster ! Join The Great Canadian Talk Show group on Facebook! Week Two of Winnipeg's Premiere Podcast kicks off with an exclusive ! Which NDP stalwart embarrassed himself on Saturday at a funeral reception, of all things, by trying to start an argument with someone who has publicly turned away from the Greg Selinger regime? We got a first hand account and name names. As well we tell you what was revealed in the confrontation about the NDP re-election philosophy. With the election writ made official, our continuing series of candidate interviews features Liberal hopeful Paul Hesse of Fort Rouge; we review the Winnipeg Sun's weekend commentary from Tom Brodbeck about Selinger "cooking the books" by not reporting money moved to Crown Corporations as grants which keeps the cash on the books and lowers the true deficit, and an editorial by Kevin Engstrom reviving the old-time Sterling Lyon-ism about the NDP spending like "drunken sailors". Meanwhile Winnipeg Free Press coverage in print and on their Margo Goodhand approved-blogs was seen by some listeners as selective reporting and a continuation of a bias against Hugh McFadyen. The Crime Courts Public Safety report includes a follow - up in the Metro by James Turner on Gordo's favorite violent homeless downtown panhandler, Faron Hall, who is in jail after being convicted for threatening a mother getting her two kids in the car; and a variety of incidents - a lot of break-ins and robberies actually - required the help of the crime chopper to track down the (alleged) perps. Episode 7, were it to be numbered, concludes with Frank the Italian Barber's prediction for this years' Super Bowl winner- he's picked 3 out of the last 4 winners folks - and how the city of Vancouver and Vancouver Police Department is desperately trying to blame the NHL for their failure to control the Stanley Cup riot, and how no one is buying it.